We’ve always had fish as pets. Currently, we have a 5 gallon tank on the kitchen counter; a few neon tetras, two snails and one glowfish swim happily against the current flowing from the tank’s filter. 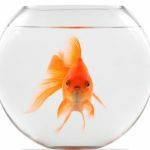 As a longtime fish owner, I read with interest a recent article in the New York Times about how goldfish released into the wild have become a highly invasive species in certain parts of the globe, including Colorado and Nevada. While I would never release a non-native species into a local pond or stream, I certainly know people who have. To be honest, I never gave it a second thought, assuming that a goldfish used to a temperature controlled, filtered environment like a fish tank would not fare well in a sewer or stream. Apparently the opposite is true; goldfish thrive in murky waters, can grow rapidly, will spawn readily and are highly destructive to native plant species. Please think twice before releasing any non-native pet into the wild, regardless of how small or insignificant they might seem!